The first Giant Swallowtails Heraclides cresphontes of the season have joined the sulphurs, red admirals, and black swallowtails dancing around the back gardens the last few days. What a delightful late-winter gift. Today when my (5 year old) grandson announced the sighting of one with that 'thrill of discovery' in his voice I could no longer resist grabbing my camera and following it around. Having butterflies make my garden their home is a blessing. I say it all the time. 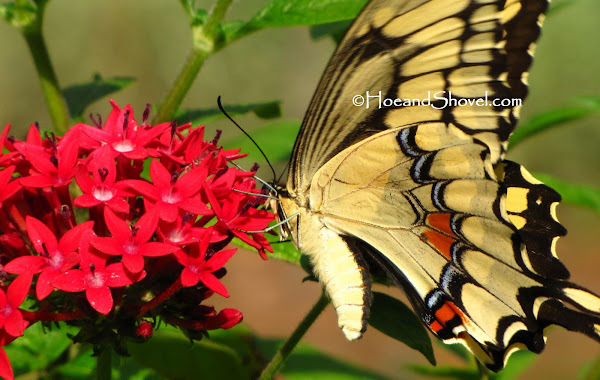 My red Pentas lanceolata are one of the most frequented flowers by all types of butterflies. 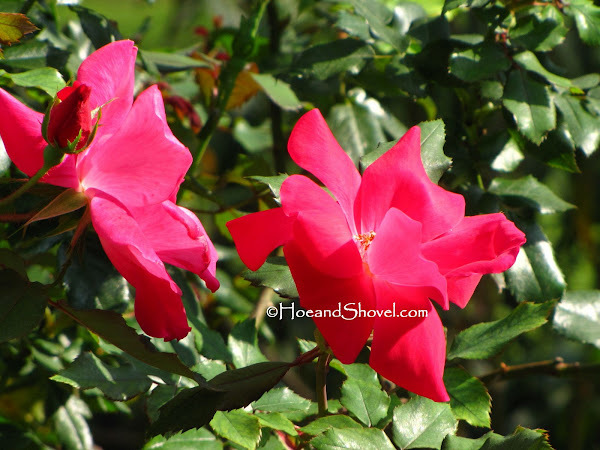 It is one of those flowers that acts like a perennial in our climate and blooms consistently in every season. 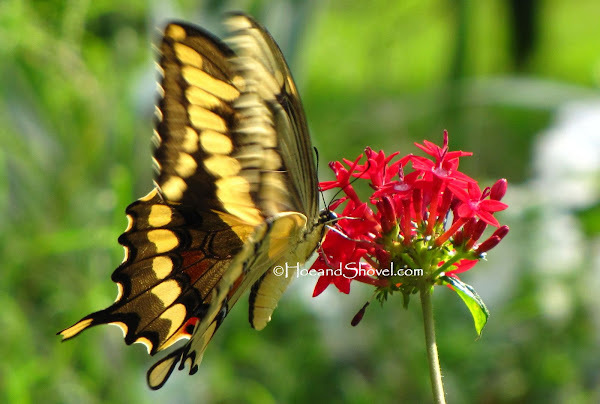 Giant Swallowtails are one of Florida's largest butterflies. Trees in the citrus family are their host plants. Males and females are similar in their markings. But females are paler yellow and have a narrower yellow band at the base of the hindwing above. Following the swallowtail around to near by flowers I missed the butterfly. But the flowers are pretty, too. 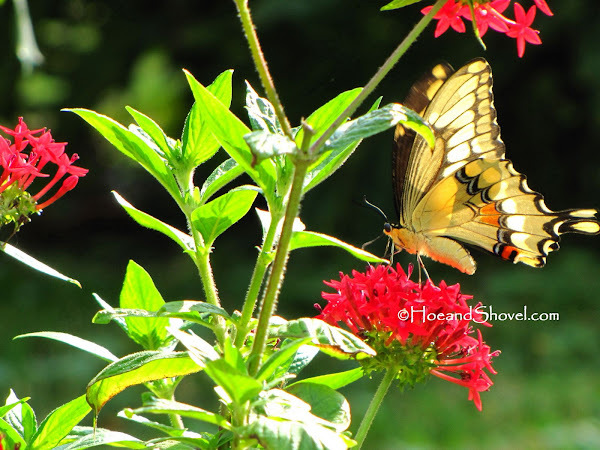 There were plenty of samplings and tastings at other flowers but the red pentas were the choice this Swallowtail returned to every time. Just one of the reasons I love my red pentas! 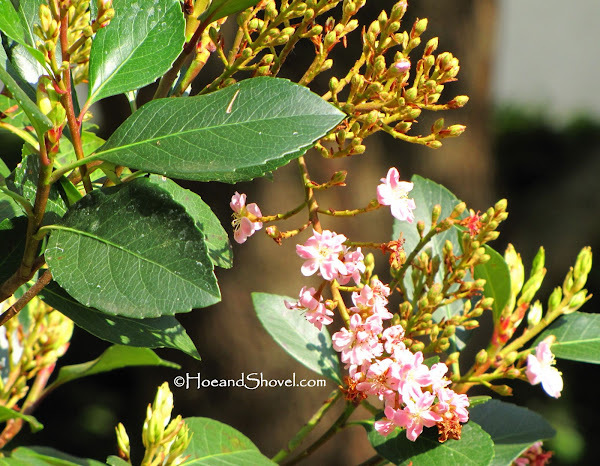 What's your best butterfly attractor for all seasons? I haven't forgotten my promise to share my visit to Classic Caladiums. It's coming. Stay tuned. What a joy to get to see your new visitors. No sign of them yet here in Texas. Still to early in spring for much critter activity. 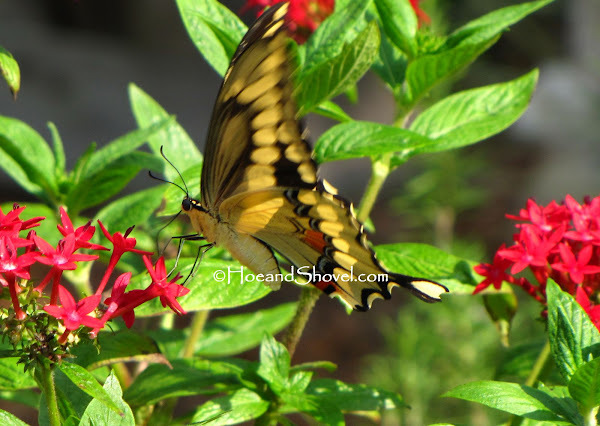 You Got some beautiful captures of the swallowtails. Enjoyed it. I am having a giveaway on my Gloryfeathers blog. What a beauty!! So far I have only had sulphurs and monarchs. My main focus this spring is to add more butterfly plants. Can't wait for your Classic Caladium pics! I noticed my first Swallowtail also yesterday. My main butterfly attractor is the hamelia patens.But they visit other flowers as well. You have some real beauties to attract the 'flying flowers'. Those were great photos by the way. Butterflies can be hard to get sometimes. I've noticed the butterflies here love the lantana and plumbego. Thanks for the lesson, I need to learn more bout these lovely creatures! Is the penta you feature here a native? I'll have to look for some of those! I'm always in awe of how many critters we have even through our winters. But as soon as it warms up like it has these past few weeks they are quick to return in numbers. I've seen a couple of monarchs and a stray gulf frit... it won't be long and they will be laying eggs like mad. The first one I saw was while standing at the kitchen sink. Then there was a second. I'm so glad they are returing. Definitely one of my favorites for the lilting way they move. Plumbago is a favorite here,too, especially as a host for the cute little cassius blue. But they aren't blooming here yet. Penta is a VERY Florida-Friendly plant~~ not a native. I'm jealous! We've had one sulphur and a couple of admirals so far. Waiting for others. I'm with you on the pentas. They are irresistible to them all, it seems. Great "catch" of that swallowtail. I haven't seen any here yet. My first ever sighting of a red admiral was my excitement for the day. You talked about them being the first to appear in your garden and I had never seen one before. So maybe a swallowtail will be next! Of all the colors of pentas I have, my red pentas were the most affected by the cold. I have a few coming back from the roots now but I have several with no signs of green. They really are the best butterfly attractors in the garden when they are blooming. My one little hummingbird liked them too. Sure hope I see him/her again. I knew you'd see the red amdiral eventually. I just love them this time of year. Almost every one of my red pentas are coming back and this year I'm trying to be patient and let them (vs. replacing them). 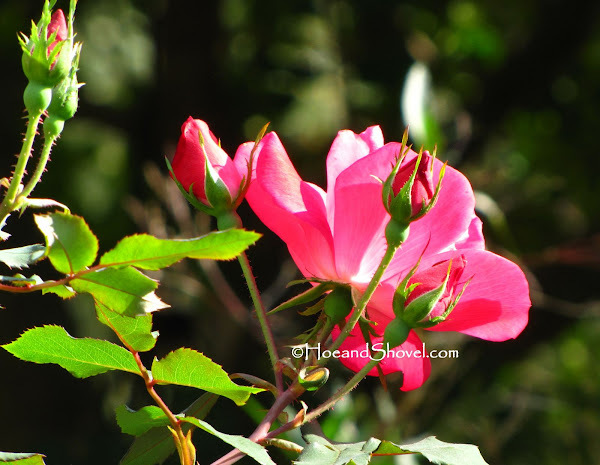 I have some pink ones tucked among the shade trees that have been there for years (some 10 yrs ~ crazy)... they always return. I don't pay much attention to them as they are part of the more natural looking areas. 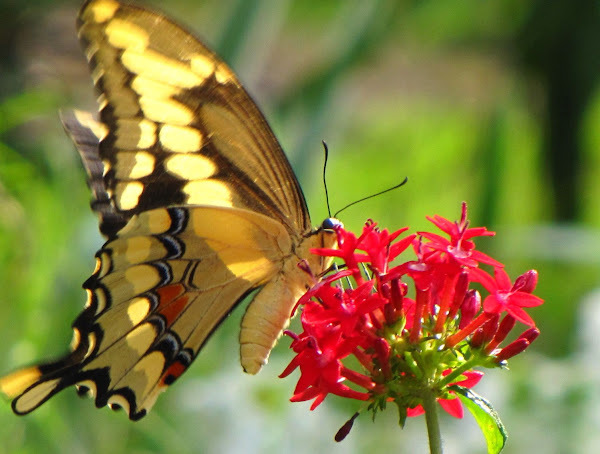 Your swallowtails are on the way. Several black swallowtails have joined the dancing scene around here. WOW! You're so fortunate to have a long growing season and the early butterflies! My best butterfly attractors are Joe Pye Weed, Agastache 'Blue Fortune' and zinnias. Golden Dew Drop is the plant in june and july that exudes the swallow tail in my yard. Butterflies are a most welcome visitor, and I noticed lots of sulphurs dancing around and a giant swallowtail. So glad they are returning to the garden. Thank you. They are a very pretty subject speaking for themselves really. I bet that was an exciting moment! I miss the days of seeing my little ones with wonder in their eyes. (I think it's time for me to get a grandbaby.) We've been seeing lots of butterflies lately. So happy spring is here! 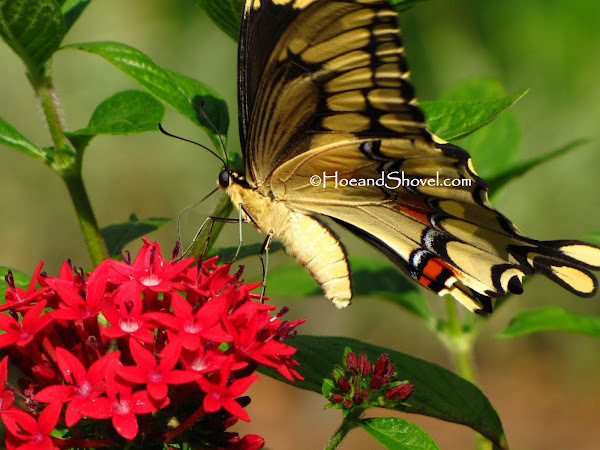 I agree...Pentas is one of my top butterfly plants as well. Most of mine were fried in the freezes and don't have blooms yet. A few did come through, though, and are entertaining the butterflies. 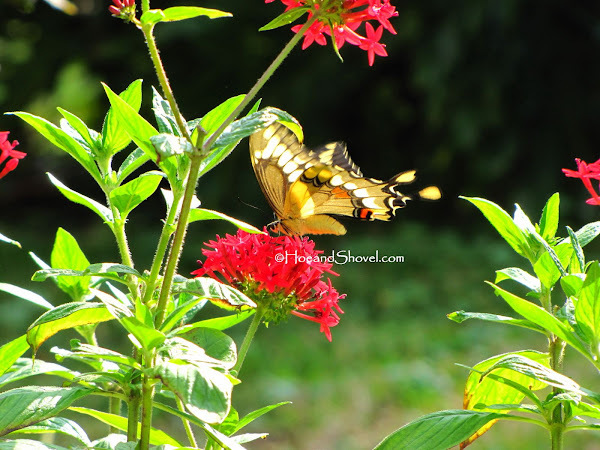 I love Swallowtails! Your photos are beautiful. I've got to plant some pentas this year. Do you have the Zebra swallowtail as well? It's so nice to see you out and about. :-) I LOVE Joe Pye Weed. Never have gotten a grasp on whether it will grow here... don't see it for sale and haven't done the research. But my association with it is when we visit the NC mountains. I tried Agastache (mine is 'black adder' ~ not all Agastache does well here) because of you and now I love it~~ as a perennial it is coming back fast from the frost. When it blooms it is a magnet for all the flying critters. Zinnias are a must for butterflies and bumbles. I'd say the Zebra Swallowtail is likely one of my very favorites. Love the flight pattern and the wing patterns. The past couple of years I have only seen a few periodically drift through the neighborhood. I see them more often when I am in wooded areas/flatwoods habitats. Some of their nectar plants are in my garden but no host plants. Do you have them? 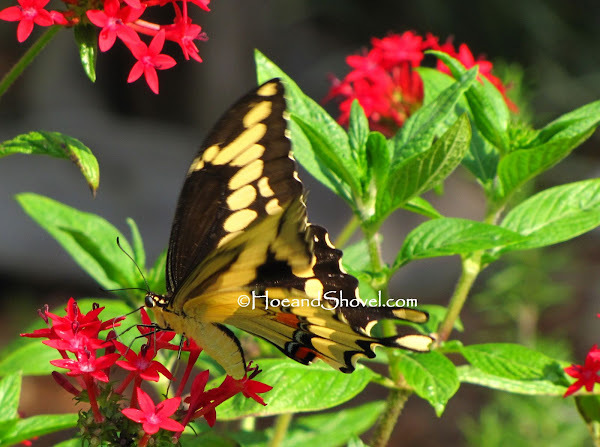 Swallowtails show up here for azalea season, then go off somewhere and return when pentas and lantana are out. They love tithonia too, midsummer. I don't think I've ever seen a Giant Swallowtail here. I have lots of Monarchs on my milkweed, and my neighbor has a Passion Flower Vine, and her Gulf Fritilaries are always visiting my purple coneflowers. I used to have red pentas. I think the ones poking up out of the ground are purple. Thanks for the gorgeous photos. Such a joy to see the Giant! 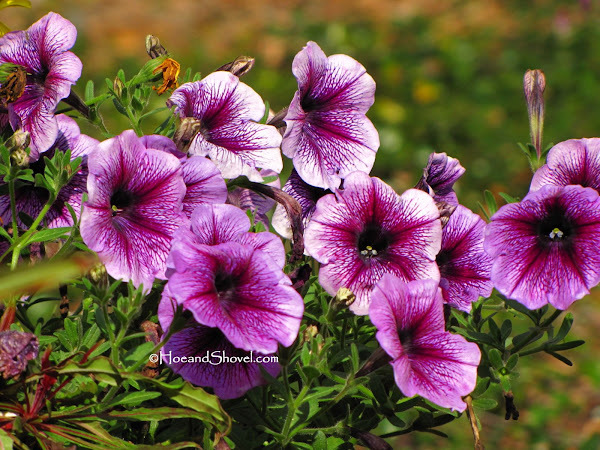 It will be a few months before they once again grace my Gardens I do grow lots of host plants for the Swallowtails. I have four Paw-paw bushes for the Zebras..they also are one of my favorites. It is azalea season down here. They are popping out everywhere in glorious abandon. Just watched two very busy female monarchs laying eggs all over the milkeweed this morning. Love it. No activity yet on the passion vine but Gulf Frits will be taking charge of it soon undoubtedly. I envision your garden to be a beautiful sight with the zebras and the giants enjoying the goodness of it. Your spring is almost here, too.